To put Florida’s capital city on the map for future-focused health care, Tallahassee Memorial HeathCare wanted to think big — over 340,000 square feet big. Welcome to the M.T. Mustian Center. This six-story addition to TMH’s campus will feature 28 new operating rooms, four interventional suites and 72 adult intensive-care-unit rooms. Sixty of those rooms will be operational the day of opening, and 12 more will be added as needed. 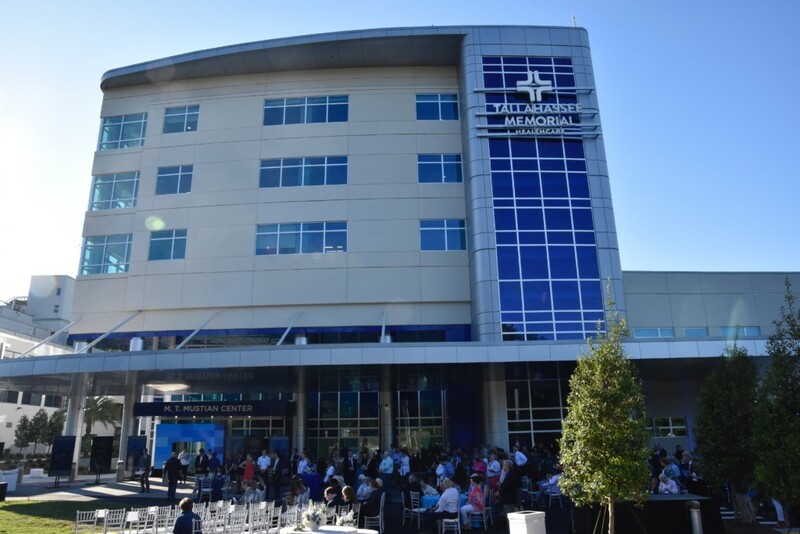 Mark O’Bryant, president and CEO of TMH, and other key stakeholders unveiled the glossy new facility at a grand opening celebration on Thursday evening. It opens on May 20. “This will serve as a magnet for our community to recruit and retain the best physicians, the best nurses, the best staff, that we could possibly have to care for our community,” O’Bryant said. The center honors the memory of TMH’s longtime administrator, Middleton Truett Mustian. Carrying on his legacy, the facility will bring more advanced health care services and the latest medical technology to Tallahassee, hospital leaders say.TMH says it designed the facility with patients and families in mind. Wall murals bring color and local Floridian landscapes to ICU rooms, and large windows offer natural lighting. During long days and nights, visitors can grab a cup of Lucky Goat coffee at the Eyes of Texas Café — a nod to Mustian’s Texan roots. The center has been a decade in the making, with planning and development starting in 2008. O’Bryant said the board of directors realized that the hospital’s operating rooms and intensive-card units, while functional, weren’t designed to support emerging technologies for a growing population. Hospital leaders see the new facility, a $270 million investment, reaching beyond Tallahassee and the Big Bend. Tallahassee Mayor John Dailey attended the celebration and noted that TMH is the largest private employer in the city. “I offer congratulations that you have this state-of-the art facility right here in our backyard that truly puts us on the map,” he said. You can find more information about the M.T. Mustain Center on their website.